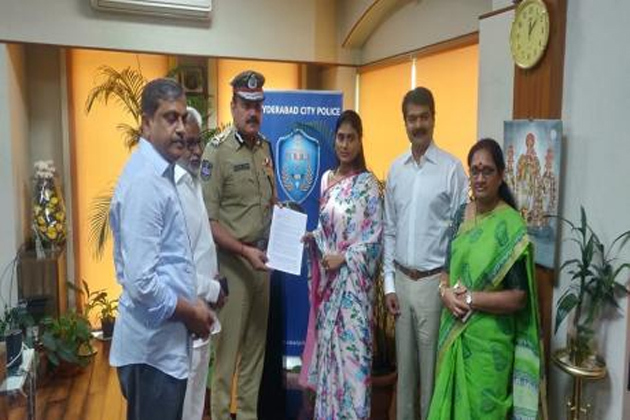 Hyderabad Police responded promptly over the complaint filed by YS Sharmila against the malicious campaign being run on the social media to tarnish her image. Police Commissioner Anjani Kumar referred the complaint to the Cyber Crime-wing. A Case has been booked under Section 67 IT Act 2000 (Spreading blatant lies through usage of electronics) and Section 509 (Insulting Women) of Indian Penal Code. Additional DCP Raghuveer is leading the investigation of this high-profile case. A Special Team has been constituted to trace the culprits at the earliest. While addressing media, YS Sharmila spoke about the Social Media campaign linking her with Hero Prabhas. By swearing on her children that she has neither met nor spoken with the Bahubali Star till date, The YCP Leader challenged whether those behind the false campaign have the courage to show any evidence or swear on their children. She even suspects the role of TDP in the character assassination citing how YSR was branded as factionist and Jagan was projected as arrogant in the past. 5 Years long campaign to tarnish the character of Sharmila will come to an end with the intervention of Cops. What Can Kodandaram Do Now? It's Official: Jammalamadugu YCP Candidate!